An Irish Library – the sale at James Adam in Dublin at noon next on April 17 – reflects the sort of weird and wonderful idea of the library in an Irish country house. This is as repository for all sorts of exotica. This interesting sale offers a range of books, furniture, art, taxidermy and militaria. 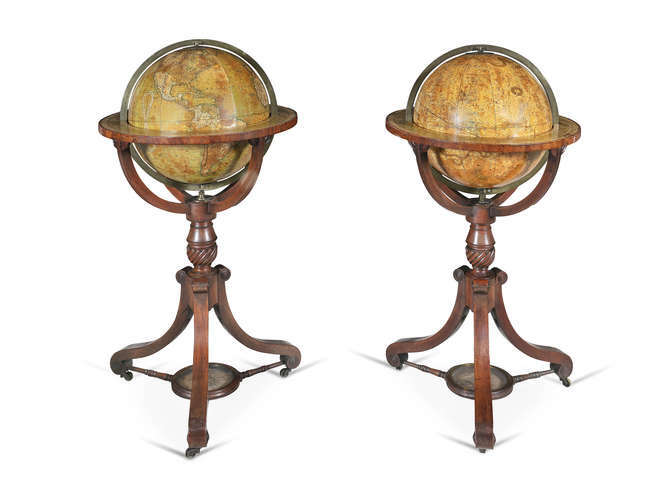 Ten coloured engravings by Giovanni Ottaviani of Raphael’s Loggia, an outstanding pair of celestial and terrestrial globes, a pair of Irish carved side tables, a magnificent George II secretaire and a Killarney davenport are among the prime lots There is art by Richard Carver, Edwin Hayes and Erskine Nicol and taxidermy includes antlers, a wild boar, a lion and a bear cub. The catalogue is online. This entry was posted on Monday, April 15th, 2019 at 1:13 pm	and is filed under AUCTIONS, COLLECTIBLES, FURNITURE. You can follow any responses to this entry through the RSS 2.0 feed. You can leave a response, or trackback from your own site.